Despite the obvious opportunity to delight their older customers, the financial industry has a poor track record in responding to their needs. 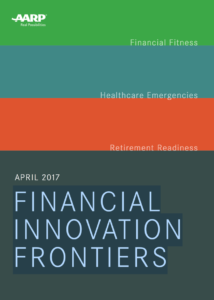 The AARP has just published a useful, downloadable guide; FINANCIAL INNOVATION FRONTIERS which, among other things, highlighted five key areas where financial service innovators can have a transformative impact on the 50+ generation. As with most innovations that please older customers, they will also improve the experience for younger consumers. Remove friction from the user experience. As is true with the banking industry in general, all processes and channels must be simplified. Improve customer service. Connect the 50+ consumer with advisors during key financial moments, helping consumers to become financially independent. Proactively deliver personalized insight and advice. As with the industry in general, using data to deliver personalized solutions is the key to success. Personalizing in the context of healthcare costs, retirement savings, risk tolerance and the unexpected is more important to this segment than any other. Transform financial anxiety into digital empowerment. Help consumers use new digital tools to their advantage including budgeting, automated savings, expense management, etc. Influence regulatory change and financial policy. Encourage healthy digital disruption in consumer protection, privacy, new market entrants and all areas of compliance and regulation. As good as this AARP report is, our experience shows that theory is one thing, putting it into practise is another. Adapting to the needs of older customers requires an understanding of the psychological and physiological aspects of longevity. These issues can impact every touchpoint along the customer journey, from the initial marketing communications through the digital experience, the retail experience the products and services and so on. We call this ‘Lifetime Customer Experience‘ – something that can appeal equally to customers of all ages. It’s a major corporate undertaking but one where the rewards are obvious.